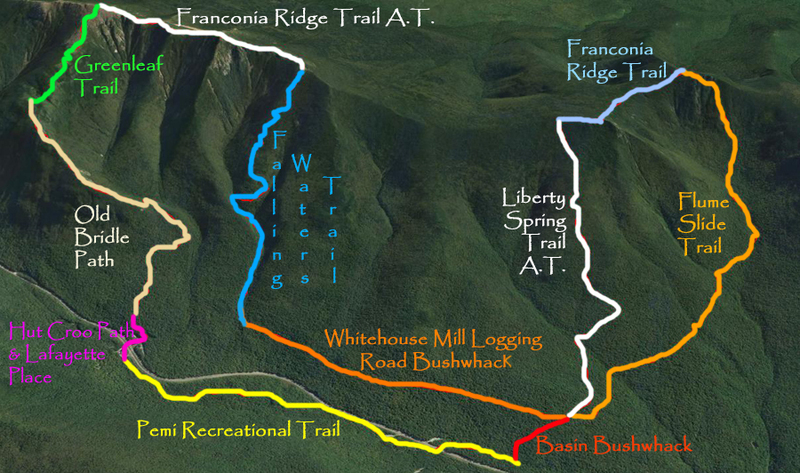 - Every fall I like to do the classic Franconia Ridge loop hike over Lafayette and Lincoln. This year I did that plus a little more. I decided to start at Lafayette Place and take the Pemi Recreational Trail and the Basin Bushwhack on my way to hiking up the Flume Slide Trail to Mount Flume. Then I headed across the Franconia Ridge Trail to Mount Liberty and down Liberty Spring Trail. At the junction of the Liberty Spring and Flume Slide trails I used the old Whitehouse Mill Logging Road to cut over to the Falling Waters Trail. From here, I did the classic loop up and over Lil' Haystack, Lincoln, and Lafayette, via Falling Waters Trail, Franconia Ridge Trail, Greenleaf Trail, Old Bridle Path, and the Hut Croo Path. - Foliage below 2000 feet was still pretty great, maybe just past its peak as the trails where blanketed by a few inches of leaves in spots, but there were plenty of bright yellow colors all around through the hardwood sections of the woods. - Views up above treeline were tremendous as usual, while the bushwhacks and Flume Slide Trail where a lot of fun plus I had the slide and bushwhack sections to myself. Everywhere else the trails were definitely busy, good news was that almost everyone I ran into was having fun and were pleasant.